I've been eyeing for a steak for days prior to our Sunday morning trip to Bonifacio High Street. What I was really after was the shoe sale at the 4/F of Dimensione. I guess we arrived a little early as the stores were still closed except for some food establishments. So Alfred and i decided to go get my cow craving and went to New Orleans beside Clawdaddy's. Thinking that baby back ribs may take some time to cook, we opted to take a look at the appetizer section. 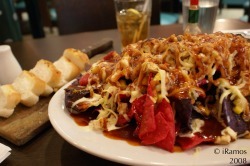 Found this entry for a barbecue chicken nachos for a little over Php 200 (210 I think). I figured, price is not bad... I wonder if the whole thing fits on a tea plate. I was almost finished with my second glass of iced tea when the food service staff brought us this humongous plate of nachos. It was love at first sight! Fiesta nachos were complemented with chicken chunks, mangoes, chilis, cheese and a shiny, thick barbecue sauce that makes the whole thing very appetizing (mmm nachos *gargling in drool sound*). We were just having the time of our lives with our appetizer. It Filled us up enough to a point that we couldn't touch our entree anymore. Serving was good for 3-4 people. Definitely a must-return-to nacho place. keeping me from buying (and eating) too much. food..hmmmm cupcake. I was expecting myself to get turnedoff once I see the price on the smores (hmmm smores *drool*). Lo and behold, it only costs Php 35 for the regular varieties! Now who could resist that?? Next question there is if it's as good as it looks? It didn't disappoint me at all! I've been hooked since then. I'm definitely getting them for my wedding! 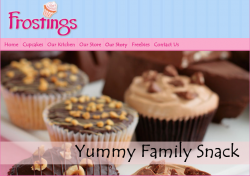 They also create cupcakes for special occassions, so do check them out! Three things I do involuntarily: breathing, cooking and, eating. In as much as I love cooking for my husband, dining out is something we do when we go out for out weekly dates.